As a marketer, you’ve probably heard about ultimate guides. You’ve probably read a few (at least), too. Maybe you’ve even created some yourself. Whether you call them “ultimate guides” or something else (like one of Business Casual Copywriting’s ten better suggestions), the idea remains the same: build a multi-chapter guide covering an entire topic in deep detail. Sure, they take time and effort to get right. But, when done well, they can rank for tons of keywords, establish you as a topical authority, and drive enormous amounts of traffic. Choosing a topic for your guide. Planning the exact chapters you’ll create (and keywords to target on each one). Examples of excellent guides you can follow for inspiration. This is the exact process we walked through to build our own comprehensive guide to marketing strategy we recently launched. That’s something we’ve gotten a lot of questions around, and we’re glad to share what we learned with you here on the CoSchedule Blog. Now, let’s roll up our sleeves and get down to business. Content Marketing Calendar Template: Map out deadlines for each piece of your guide on one calendar. It’ll serve as your team’s single version of truth so everyone (writers, designers, developers, and project managers) is on the same page. Keyword Research Template: Store your keyword ideas for each page in your guide. Capturing search traffic is a big part of what this is all about, and nailing your keyword research is important. Web Page Content Writing Template: Make sure each page in your guide includes the right information for your developer to implement. That includes on-page content, title tags, meta descriptions, and more. Latent Semantic Indexing Infographic: Latent semantic indexing sounds more complicated than it is, but it’s important to understand if you want to rank higher for more keywords. This infographic explains how the concept works, and how you can apply it to your guide. What Is An “Ultimate” Guide? So, as you may have guessed, we’re not big fans of the term “ultimate” guide. That’s mainly because it’s an overused term. However, it’s also the most popular and widely-used phrase for what we’re describing, so we’ll concede defeat and use the terminology folks know. It covers a broad topic in detail. If you have a competitive keyword for a broad topic, it’s a good candidate for this type of guide. It features one main page and several smaller chapter pages. Generally, this means building out a main page with a well-designed table of contents linking to each chapter page. They may also use deep links embedded on a single page to break out chapters. The idea behind this is to rank each page for several different keywords. This makes topical guides a high-effort, high-risk, and high-reward proposition for marketers to tackle. Sometimes, you’ll see blog posts with “ultimate guide” in the title. We’ve even published posts like this ourselves. However, for our purposes here, we’re talking about in-depth, multi-page guides, or single-page guides that use deep links for each chapter. What Are The Benefits to Building Comprehensive Topical Guides? If you’re going to put in the work, there needs to be a payoff. Here are some of the primary reasons to create guides. Ranking for large numbers of competitive keywords. Building topic clusters around a central theme makes it easier to rank more pieces of content for more keywords. Interlinking several pieces of related content together sends a strong signal to search engines that you have a lot of good, authoritative content on a subject (and it makes it easier for readers to find everything they’re looking for). Attracting links. Big, in-depth resources make awesome targets for other sites to link to. One high quality guide can keep attracting links for months or years. Positioning yourself as the go-to authority on your topic. Building trust builds customers. Before we show you how to build a guide of your own, it might help to show you some examples first. Here are some quality examples you can follow for inspiration. Ranking first for the term “SEO” is … insane. That’s exactly what this guide does, and has done, for years though. It’s the end-all, be-all guide that practically everyone in the business reads when they’re starting out (or looking for a reference). Check it out here: The Beginner’s Guide to SEO. While this is similar to the Moz example above, what we like about Jeff Goins’ guide is its simplicity. If you don’t have ample resources for design and development, something like that Moz guide might be out of your reach. However, this one is a bit more simple in terms of aesthetic and structure, without sacrificing content quality or usefulness. Check it out here: The Beginner’s Guide to SEO (For Humans). This one is a little different. Instead of unique pages for each chapter, it uses deep links (which add a # and a slug) for each chapter. 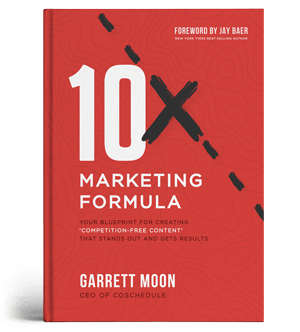 Check it out here: The Ultimate Guide to Book Marketing. This guide uses unique URLs for each chapter, and then uses deep links for each section within each chapter. It also keeps the design clean, relying on copy over images. Check it out here: TapClicks Content Marketing Guide. This is our own guide, written, designed, and developed from to finish by only three people. We set out with the aim to create the web’s best guide to marketing strategy (and we’ll let you decide if we achieved that goal). When we started our own guide project, we managed our workflows and team communication with CoSchedule. Considering the project’s complexity, we can’t imagine how it would be possible without using some sort of marketing management platform. Content writers. Everything here starts with the written word. Graphic designers. If your pages will have designed graphics, this role will be essential. Developers. Unless you’re going very barebones and creating everything yourself with plain WordPress pages, a developer will be required to bring the project to life. Project managers. Someone has to herd this whole team and make sure deadlines get met. Account managers. If you’re at an agency, your account manager (or other title for client liaison) will need to understand the progress of the project in order to communicate with your client. Time for kickoff and planning meetings. Writing 10-12 pages of web content. Coding and developing the entire guide. Creating social media promo content. Four hours of writing and research. Three hours of graphic design. Two hours of development (after the structure of your pages has been built). Ultimately, only you know how long it takes your team to complete work. Determine reasonable deadlines, and then plot them out on your marketing calendar. If you’re using CoSchedule, start by using Marketing Campaigns. This is a feature that makes it easy to organize all the different pieces of a campaign or project. Now, you’ll be all set up to execute your guide smoothly from start to finish. Talk to your head of marketing or sales. Ask them the same question you asked yourself. Refer to your company’s mission statement. You can likely spin off some ideas from there. Determine the number one problem your product solves. A guide that offers information around that problem would probably be helpful, too. From there, your topic should also be broad and complex enough that it would require a substantial piece of content to cover in full. The idea is to create a guide around one primary topic with several sub-topics beneath it. Once you have a topic selected, it’s time to start your keyword research. This entails finding one primary keyword and tons of relevant secondary (or Latent Semantic Indexing) keywords. Essentially, your primary topic is your main pillar content, which links down to multiple pieces of related content. Your pillar content should target your most broad and (most likely) highest-volume keyword, while your related content should target more narrowly focused terms. Ahrefs Keywords Explorer. This is a premium tool included in Ahrefs growing SEO platform. It’s by far our favorite option for getting detailed keyword data. Moz Keyword Explorer. Similar to the Ahrefs tool, you’ll need to be a Moz customer to make use of this one. SERPs.com Free Keyword Research Tool. This freebie is useful for quickly checking keyword search volume in a pinch. Google Adwords Keyword Planner. It’s free and practically ubiquitous with keyword research. While it’s geared toward PPC, it still has value for organic SEO, too. LSI Graph. This free tool is incredibly useful for spinning off related keywords from one core topic. Ubersuggest. Enter a keyword and this tool returns actual Google autocomplete suggestions. While these are tools we either use, or have used, there are tons of other options out there. Those include paid tools like SEM Rush, SECockpit, and LongTailPro, and free alternatives like WordStream’s free tool, SEO Book’s classic options, and KeywordTool.io’s free tool. Search volume. This is an estimate of how many times a keyword gets searched per month. Keyword difficulty. This measures how tough it’ll be to rank on a given keyword. Parent topic. This is something that’s unique to Ahrefs (and what makes it helpful for this kind of work); it tells you which top-level topic your chosen keyword is related to. This is extremely useful for narrowing down your topic and primary keyword for your pillar content. When choosing keywords for a guide, don’t be afraid to target more high difficulty terms than you normally might. You’re going to put a lot of work into this, so aim high. Continue with your keyword research process until you’ve built a strong base of search terms. The next step is to sort your keywords. Assign one primary keyword per page you’ll create. Then, select secondary keywords to help round out each page in your guide. The primary keyword for each page. This is the main keyword each page should focus on. It should be directly tied into the main topic for your pillar page and each sub-page. Your LSI keywords. These terms should be used on each page, supporting the main topic on each URL. Search volume. Make prioritizing keywords easier by recording the search volume for each one you’ll use here. Include your primary keyword for each page in your URL slug. Each page prioritizes the most broad, top-level keyword for its topic area. Each LSI keyword is a sub-point beneath that primary keyword. There isn’t a fixed number of keywords to target on each page. We’re just adding what’s relevant and makes sense in context for each page. Keep going until you’ve planned every page that’ll comprise your guide. Once you know what you’ll write about, it’s time to dive into research. After all, if you’re going to position yourself as a topical expert, you need to actually be an expert (or do an extremely convincing job of sounding like one). If you need help getting started, we’d recommend beginning with our list of 30 content research tips. You’ll be sure to grab at least a few new ideas to help you nail your research. Now, it’s time to start writing all your content. Title tags. These are the blue links that appear in search results. They tell search engines and users what your page is about. Meta descriptions. This is the block of text that appears beneath your title tag. They should encourage click-throughs in 156 characters or less. Headlines. Make ‘em stick with our Headline Analyzer. Body content. Make each page in-depth (word counts aren’t important, but you’ll likely need at least 1,000 words per page). Calls to action. If you have a conversion step you want people to complete (like starting a trial or joining your email list), then include that CTA on each page. Now, let’s make each of these things the best they can be. Since you’re likely targeting some competitive terms with your guide, it’s essential that you stress every detail. Include your primary keyword. This is the most important on-page element that search engines use to determine what your page is about. If it makes sense, consider moving your primary keyword as far to the left as possible (the first words that appear in a title tag are treated as the most important). Stay under 70 characters. This is Google’s limit before they get truncated. Be consistent with your page’s headline. The title tag and headline should communicate the same message (but they don’t necessarily need to be identical word-for-word). Like we said earlier, meta descriptions should be no longer than 156 characters (don’t make them too short though). While they don’t impact rankings, they do influence users to click. Think of them as small blocks of ad copy that sell readers on the idea of reading your content. Include your primary keyword. This helps show that your page is relevant to what the searcher is looking for. Tell people what they’ll find on your page. Summarize the main points of your content. Be sure to incorporate a clear benefit to your reader. Create some urgency. Make people want to click that link. It includes each of the elements listed above (primary keyword, summary and benefit, and a callout to free templates to further entice clicks). Use the SERP Preview Tool mentioned above to test your meta descriptions for each page. Catchy headlines are key for selling readers on your guide. The easiest way to optimize your headlines is with our free Headline Analyzer. We recommend writing 20 to 25 headline options per page. Then, settle on your best work. Make sure each headline includes your primary keyword phrase on each page. Clear formatting. Stick to H2 and H3 heading tags. Going smaller often results in messy looking pages. Strategic keyword placement. Remember your LSI keywords? Work those into your H2 and H3 subheadings as appropriate. Actionable how-to steps. You’re creating a guide to help people learn how to do something, right? So, actually show them how to get it done! Use a mix of step-by-step action items and videos to clearly demonstrate how to implement your advice. Comprehensiveness. Cover that entire topic in full. The more complete your content, the better. Use the Skyscraper Technique to make sure you create the most resourceful content available on the web. information that’s actually useful to your reader. The subhead is in an H2 tag. It also includes a long-tail keyword. The body text is broken up with bullet points where appropriate. This makes the page easier to skim and read. Callout boxes are used to add visual interest. If you’re using WordPress, you can create a similar effect following this guide (warning: it’s very developer-centric) or using this plugin. To make writing your content easier, we’ve included a web page content writing template in this post. It’s included in the downloadable bundle you can find near the top or using the left-hand widget on this post. It’s made to make writing all your content easy while making everything presentable for your designers and developers to interpret. A short and punchy line of copy. Keep it to five or six words at the most. Compelling button copy. Two or four words, including a strong verb. For extra credit, consider A/B testing different options. After all your content has been written, it’s up to your designers and developers turn your content docs into actual web pages and get everything launched. If you’re a content writer or marketer involved in content planning and creation, there are some things you can do to make this easier. Here are some tips. A brief one or two sentence description of what the graphic should be about. The exact text you want included on each graphic. Or you can make it a different color (one that will stand out) within the text in your content doc. This can make it a lot easier for designers to know what your expectations are when it comes to their work. This means giving your development team the exact content and meta data you want included on every page. If you use the web content writing template included in this post, this should be simple. Text that you’d like placed within H2 and H3 subheadings should also be called out in your content docs. Having this information up front is necessary for your developers to work efficiently and ensure that everything is formatted correctly for readability and on-page SEO. If your designers or developers suggest making changes, or let you know that something will need to be adjusted or won’t work, keep an open mind. You’re working together as a team to make your guide great, and that might mean making changes from your initial vision. Once your guide goes live, you’ll need to promote it like crazy. The more you can have planned up front, the easier it’ll be to execute your promotion strategy. Choose your networks. Twitter, LinkedIn, and Facebook are some obvious choices. 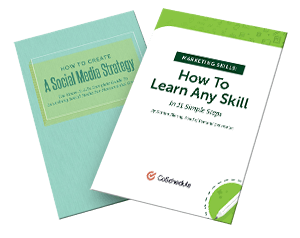 Write effective social media posts for each one. Avoid cross-posting. Schedule your social promotion for the long haul. You want to keep driving attention and traffic to your guide long-term. Using ReQueue (the only intelligent social media queue) is the best way to do this. We’ve created an in-depth guide to [INSERT TOPIC]. It’s titled [INSERT HEADLINE], and it’s something we’re really proud of. Would you mind taking a look and letting us know what you think? If you’d like, feel free to share it with your social followers. Take some time to personalize this template and add more context around why your specific guide is valuable to their specific audience. Most of the time, people that you know will be glad to help. Just be sure to reach out to people you have an actual working relationship with. Here’s the moment of truth. Your guide is out in the wild. It should be ranking for tons of keywords and driving incredible traffic, right? Use Google Analytics and rank tracking software to find out. If you’re using Moz or Ahrefs (two SEO platforms we mentioned earlier), add all the primary keywords you’re trying to rank for on into your campaign. If you’re looking for a free option, SERPs Rank Checker tool is decently reliable. They also offer a complete premium SEO platform like Moz and Ahrefs you can consider, too. Beyond just looking at rankings though, here are some specific things to keep an eye on. Total traffic. Track how much traffic is going to each page of your guide. Total number of ranking keywords. Ahrefs and Moz both make it possible to see which different keyword phrases are sending traffic to your pages. Conversions. How many of those visitors are taking your desired action? Learn how to track conversions in Google Analytics with this guide from AdStage. If you’re a CoSchedule customer, you can also use Top Content Reports and Social Engagement Reports to measure social media performance. You now have the game plan you need to build your guide and start ranking on those competitive keywords you always thought were out of reach. All you need now is time and the commitment to succeed. Do you have any experience developing quality guides to share? Leave us a comment and help start the conversation.